PERRIN Performance has made it easy for you to mount dual Hella horns in the front grill of the Subaru WRX and STI. These brackets are perfect for installing the Hella Super Tone or Sharp Tone Horn sets. CAR SPECIFIC The PERRIN Brackets for HELLA Horns are designed in three variants allowing for a perfect fit on your specific model of WRX/STI. Being tailored for specific models makes for better fitment than competitors' universal brackets. ADJUSTABILITY The PERRIN Brackets come with slotted mounting points for horn assemblies. These allow for fine-tuning of the position of horns to work with unique setups. 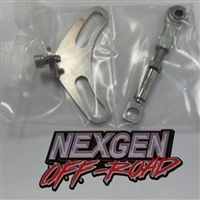 MULTIPLE MOUNTING POINTS By offering multiple mounting points, the connection between the radiator support and bracket is solidified and reduces unwanted flex under all driving conditions. CONSTRUCTION Made from thick, precision laser cut, and CNC formed 304 Stainless Steel, this brackets are designed to withstand all climates and not fatigue over the lifespan of the product. FINISH Texture powdercoated black with a vivid PERRIN logo, the PERRIN Brackets for HELLA Horns are guaranteed to continue looking great while being used. HELLA HORNS The PERRIN Brackets are designed to work with Hella's horn assemblies, this includes the popular Super Tone, Sharp Tone, and other models. Click here to purchase a set of Super Tone horns if you do not require a bracket. (60) month period from the date of purchase. The internal wastegate(IWG) bracket is used in place of the stock wastegate actuator when moving to an external wastegate setup. In previous years, Subaru owners had to weld the IWG shut on their turbos which diminished resale value, had the chance of cracking, and made it very difficult to revert back to the stock IWG setup. 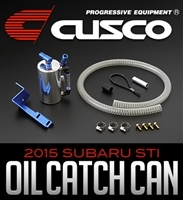 Cusco has introduced their direct fit oil catch can for the 2015 Subaru STI. Cusco's oil catch can will help reduce oil buildup in the intake tract to maximize engine efficiency and life. It will also help reduce condensation inside the engine which can lead to issues down the road. Cusco's catch can features a polished aluminum construction with all hardware needed for installation. 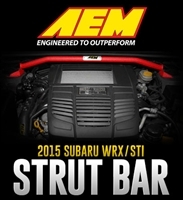 The AEM performance strut bar provides additional vehicle stability on the 2015 Subaru WRX and STI models. AEM strut bars are constructed from 1-1/2 inch steel tubing, providing great strength and low weight which gives you a true racing option and a more professional alternative to many hinged or weaker strut bars on the market. This performance strut bar comes in a textured red powder coated finish featuring the AEM logo giving a clean high-performance look under the hood.